Melissa, thank you for sharing your home decor inspirations with us. You have such a keen sense of how to make your living space warm and welcoming. I adore the blown glass lanterns; they have such a rustic charm and add more dimension to a table top display. Bravo! Love reading your blog daily! The blown glass lanterns caught my eye right away. :) How beautiful! What a great giveaway! Melissa, I can’t wait to see what you will do with your house for Christmas this year! My morning ritual starts with a cup of coffee and the Inspired Room. I love the way you are able to take simple things and create a warm and inviting space. The lanterns are beautiful and so versatile. I love reading your cozy blog :) Thanks for sharing about Mary and Martha – what a neat site. I am always looking for a little something-something for entertaining! Your cranberry cider drink has me in the mood for an informal gathering! Thanks for the inspiration! I’ll take a “Mary” approach to the party, instead of a “Martha” approach, and keep the focus where it belongs! Your home looks amazing! And I can’t wait to make your cranberry cider! Thank you Melissa for introducing us to such a beautiful product! I am always looking for unique pieces to entertain with and these are just gorgeous. Your home is an inspiration. I love your blog. It’s so inspring and beautiful. Fall is my favorite time of year and I love NESTING this time of year too! Those hand blown glass lanterns are absolutely beautiful. Definitely will have to check them out! I love reading about the changes and doings in your home and can’t wait to see what Christmas will look like. I love all the Mary and Martha stuff! I wonder if it’s because my name is Mary and my sister’s name is Martha???? The hand blown glass lantern is lovely…Mary and Martha site is great! Your home is decorated beautifully. Very classy Holiday decor. I love those lanterns. Thank you for the giveaway! I just love your home. Thanks for the opportunity to win some lovely stuff! Thanks for sharing your home! It looks so peaceful. Loving the Mary and Martha items! I so enjoy seeing how you put things together and make them pop. Your house is surely a very inviting home. I am looking forward to seeing what color you use in your dining room for Christmas this year. I am so excited to try the cranberry cider recipe you posted yesterday. We are hosting Thanksgiving at our house this Saturday and I already bought all the ingredients for it. Thank you! Love Mary and Martha! Thanks for the giveaway and the inspiration from your blog. What a wonderful contest. Their products are beautiful and I would love to win. Thanks for doing this. I love all of the natural elements used such as the greenery. It makes a huge impact with such simplicity! I’ve noticed lately that the new trend it to have a coffee/tea station setup in your kitchen or dining room. I’ve been thinking about making a designated area for my Keurig and K-cups. That tray with the coffee cups would be perfect for that spot! Thanks for sharing. Gorgeous, Everything is so pretty and looks ready for all the festivities of the holidays. The cider sounds fabulous. Thanks so much for sharing with us! I am getting excited thinking about how I will decorate this year! I especially love how you keep it simple and uncluttered. I retired recently after 40 years in education. I feel so blessed to have this time to focus on my home again. I came across your blog and you are giving me new ideas and helping me update things. I am loving every day! Thanks so much, Melissa! Love visiting your (and Jack’s) blog. Your home is beautiful and so very welcoming. Thank you for a chance to win the Mary & Martha goodies. What precious nesting you do! I love the candle holder and tray…and the mugs lined up on the tray! I hope to make the cider Thanksgiving morning as the family is waking! I’ve always admired their lovely things! Thanks for the opportunity! Those gorgeous lanterns would be perfect for our “coastal cozy” bedroom! 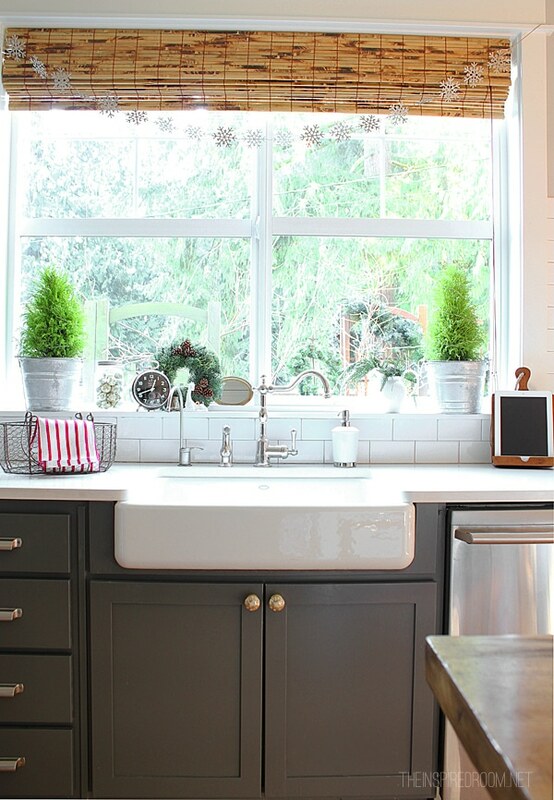 I love the little evergreens above your kitchen sink–they are adorable! 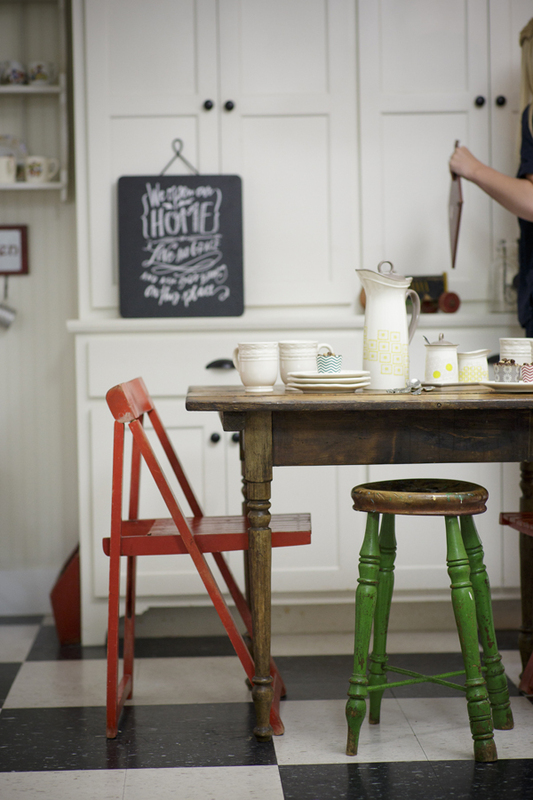 I think I need that Mary&Martha chalkboard . . . thanks for sharing! Thanks for introducing us to Mary & Martha. The lanterns are beautiful! These are a few of my favorite things, not only part of a song but the season ! Your blog is fantastic, informative and just plain fun to read. I have recently re-invented my living room. Went from Victorian style to a more fun, easy flow style. Warm, comfy, not so stuffy. I even used a drop cloth for the slip cover on my couch. Looks just like the high end covers and only cost 12.00 at the local big box store. It is fun to search and find the things that make you feel good as well as save some money along the way. Have a great holiday season !! I have been admiring all the beautiful God centered decor on Mary and Martha. The lanterns are beautiful and love yours with the suspended candle, just beautiful! Creating a coffee station and the mugs and tray would be perfect. Great giveaway. Thank you for doing so and whoever receives this can count it as a special blessing today. I love all your decorating ideas, such an inspiration! The items from Mary and Martha would look wonderful in my home! !such classy items! I love seeing your home. It is so beautiful. Love those chunky candlesticks. Thanks for hosting this giveaway. Pat. Oh I love the lantern! Also, I have made your cider several times and everyone goes crazy for it – going to whip up a batch this week to drink while I decorate for Christmas :) Thanks for the giveaway! Thank you for introducing me to Mary and Martha! Love those lanterns — putting them on my Christmas Wish List! Your blog is one of my favorites. I love your decor and ideas. Thanks for sharing. Wow, really love these pieces! Thanks for sharing Mary and Martha! Absolutely beautiful decorated rooms! Thank you for the chance to win! So lovely! Those lanterns are gorgeous! Melissa, I’ve just found your blog – a great inspiration for me! I’m such a simplist that although I love to create, I’ve always hated “decorating”. Well, it turns out that my poor husband and children can’t take any more of it, so I’m delving into the experiment of what might happen if I try to make the home beautiful while sticking to my needs of keeping it simple, authentic, and livable – starting with the holidays. One practical question: where on earth does all your “real life” stuff go? For example: in our turn of the century home, we have old built-in shelves in our living room (awesome! ), which I want to use for beautiful displays, but I end up squeezing in kids books, reference books, dvds… you know, it ends up junky with things getting stacked there. We love our old house, but we have little built in storage and can’t currently invest in storage furniture. Any suggestions? I enjoy your blog so much. Thanks for all the inspiration. Thanks for the give away opportunity…looks like a beautiful shop. Love the Mary and Martha items. Love your site…so full of great ideas! I just love your decorating style! Your blog is definitely named appropriately as I am inspired by nearly every post. Thanks for introducing me to Mary & Martha. I am certain I will find lots of great decor for my home. I really enjoy reading your blog daily! Thank you!!!! Such beautiful rooms ~ Thanks for the opportunity! I love fall nesting too. So many beautiful arrangements. I also really like those blown glass lanterns! Lovely!! I LOVE the unique and clever way you decorate your house. It is so fresh and peaceful feeling. I also enjoy seeing how you mix things like older tables and dressers with the newer things, It is a delight to follow your blog and I think that I would really just like to be you, living in your house!! Happy Fall! Thanks for sharing great sources for interiors- your photos are beautiful! I love to decorate for fall and for Christmas as well. This year is especially important as my house is on a fundraiser Christmas Housewalk! Love your style, your beautiful home and Mary and Martha! I love these kinds of items for the home! Can’t wait to see your holiday decor, Melissa! Those glass lanterns are amazing1 I’m inspired! Mary and Martha! What a great find, especially as I gear up to purchase some thoughtful gifts for family and friends. Thank you for another excellent tip on my journey to happiness in my new home! This is making me wont to spend this snow day decorating! Love your style. It would be mine if I had the creativity and originality you have. Agree with the previous commenter that I can’t wait to see your Christmas decor. Thanks for the chance to win. One can never have too many trays, right? Your home is always so inviting and especially cozy this time of year! Thank you for the giveaway and the introduction to Mary and Martha! I just discovered your blog and love it! Very inspirational! I love everything on here! and would totally love to add those prizes to my winter decor. Thanks for sharing them! Aww. Thanks for the inspiration this morning, Melissa! Really got me thinking about how I welcome my loved friends and family into my home this season! Love your blog! Thanks for introducing me to Mary and Martha! Looking forward to your book release. And those Mary and Martha lanterns are charming. Absolutely beautiful! I love the snowflakes over the window and the presents wrapped in white. So pretty! Your home is always beautiful and I enjoy watching you make changes. Thank you for the opportunity to win these beautiful things! So cozy, but fresh! Thanks for sharing Mary and Martha – love their stuff! Love Mary & Martha, especially the glass lanterns. Could fill my whole house with those. Would love to win these items for my home for Christmas. Your home is so beautiful. Love all the touches. Love the things from Mary and Martha! I enjoy reading your blog and look forward to seeing The Inspired Room in my email inbox! I love your style and have used several of your ideas in my home. Thank you so much for sharing!! Your ideas for your home are inspire me to make things simple and special. I can’t wait to see your holiday decor this year. I drooled over your holiday home tour from last year and shared with my sister and mom to enjoy too. :) Love reading your blog daily! I love the lanterns, I too love all things cozy and candle lit! Yay!!! I love all of your things from Mary and Martha! Thanks for this exciting opportunity. I adore your blog! Love your blog and the iems from Martha and Mary. I really enjoyed todays blog post! 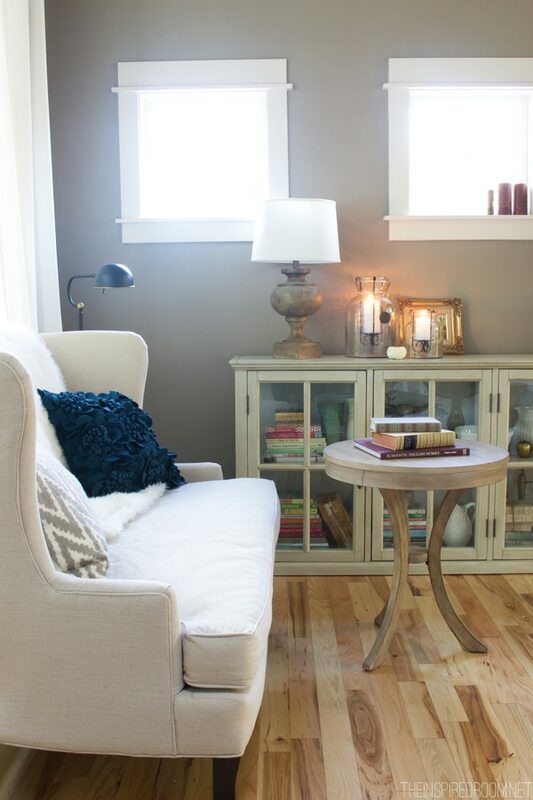 Your nesting blogs are my favorite because I love to see how your home evolves. I often use it for inspiration for my own home. I love the Mary and Martha pieces. Your home is so beautiful and inviting. Thank you for the inspiration. I’ve never checked out the Mary and Martha website before, so I’ll have to do that today. Your home looks so cozy and peaceful! I have been noticing those lanterns and would love to have some for my home! Thanks for the giveaway. I love your style and enjoy reading your blog. You have inspired me to simplify my decorations this year and get busy nesting! 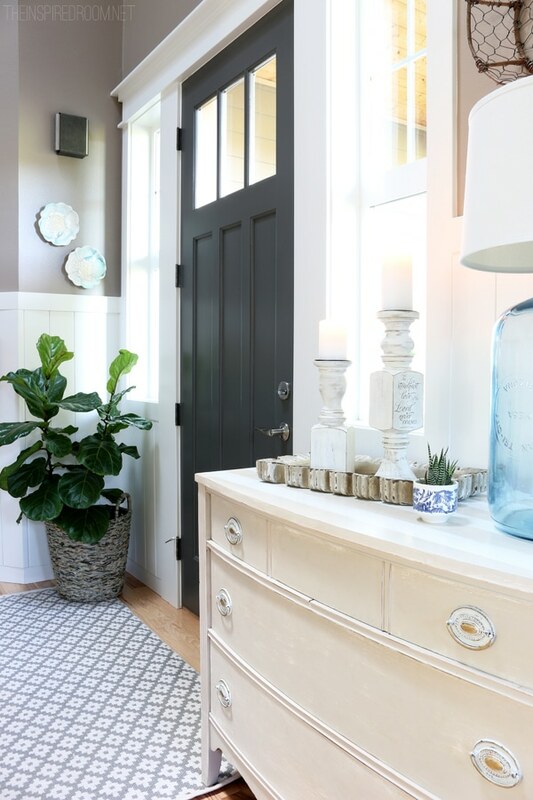 I love the items from Mary and Martha, especially your tray in the hallway and the blown-glass lanterns! Everything looks so fresh and beautiful! Thanks for the giveaway. I love this time of year too and would love to win to make our home even more cozy! As a newcomer to your blog, I am loving the cosy simplicity you show and all of the entertaining ideas. Keep them coming! I love all the ways you make your home inviting. Love the lanterns, especially the tag on the front of the big lantern. I always learn a new way to make my home more welcoming when I read your blog. I love your home, and I especially love seeing all your seasonal décor changes. Love the Mary and Martha items, and you have incorporated them so well into your home. Now, you have me inspired to putting up my Christmas items, and I usually don’t do that until the first of the month! Thank you for sharing. Love your house and love everything you posted from Mary & Martha! The title of your blog is so appropriate as that is just what you always do……inspire me! And you make it look so simple, which calls my name, too. Thank you! Yes, I agree and I love the smell of chalk (butter upper with asking to clean the erasers all the time!!!). Your house is beautiful! It encourages me to make my home more welcoming! Thanks for introducing me to this company – would love to win these products! Thanks for sharing about Mary & Martha, this is so my style and I love everything! This is by far one of my favourite posts you make it look so easy & so welcoming and comforting! Thank you for sharing! I’m so inspired for my home projects! I really like how you use white throughout your home…not too much…and nicely balanced with pops of color. When the kids are grown, I’d like to try white upholstery or covers. But with my husband counting as my eldest child…I’m not sure I’ll ever get there! Great post. Thank you for the tips and showing us the cute products Mary & Martha have. What a great giveaway! Love your holiday decorating. I just love reading your blog every morning! Love the Martha and Mary lanterns! Love all of the decorations and the Mary & Martha items! those lanterns and tray are lovely–why do so some items just speak ‘home’? That ampersand tray is my fav, love it! to incorporate some of your nesting ideas this season. I love the lanterns and sweet tag on the larger version. I love the glass lanterns-very versatile! Love your blog and the Mary & Martha decor items! You inspire me to create a cozy home!!!!! I love the simplicity of your decorating. The glass urns are especially beautiful. Thank you for your inspiration. Beautiful items! Can’t wait to see your house decorated for Christmas. 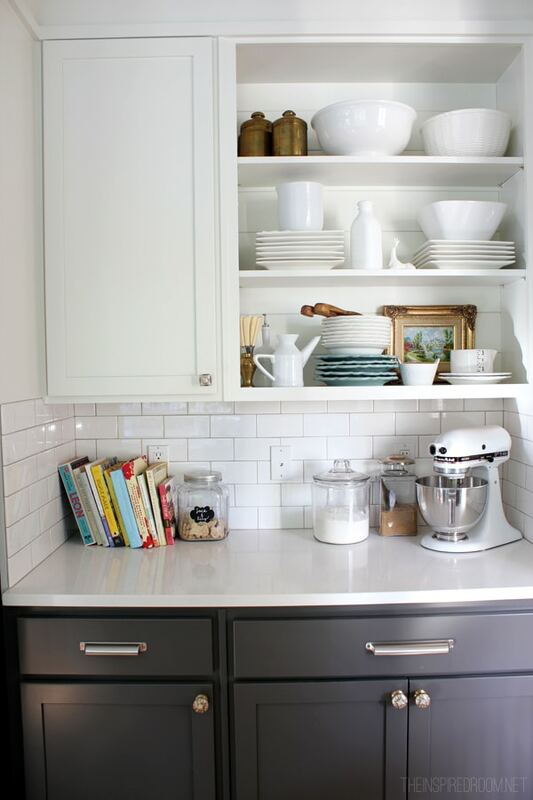 I love the shelves in your kitchen and how you frequently change them just enough to enjoy the process. Love the Martha and Mary tray, thanks for sharing your home. I love your use of trays around the house. I love all the decor! Great finds! Love the Mary and Martha tray and lanterns! I wish there was a Mary and Martha in Ohio! You’ve inspired my holiday decor!!! What great versatile items to enjoy all year! Love the glass lanterns and the apt ornament hanging on one of them! Thanks for letting us know about the Mary and Martha website – that is new to me! Your home always looks cozy and inviting but I do love the Christmas touches! Thanks for the giveaway! We are building a log home and these would be a fantastic addition to our new homes. Perfect time of year to show your family how much they mean to you by creating great holiday memories in your home! Your beautiful home is such an inspiration. I wish you were a neighbor and could give me some decorating advice! Thanks for the chance to win! I love all of your greenery. Thank you for all of the decorating inspiration! I’m off to buy se wreathed from a local Boy Scout troop. Looking at the pictures of your house gives me an incentive to try and finish the unpacking from our recent move. Thanks! I always make time to look at your email — it is some “me time” and today your home looks even more cozy and inviting. Lovely to incorporate things you use year round into your Christmas home decor! Thanks for the opportunity to enter the awesome giveaway with Mary & Martha! I can’t wait to see what you have in store for us this Christmas Melissa! Love the Tray!! Your house looks beautiful. I’d love to win! Love your blog…your home is such an inspiration! I always wonder how to make my home look cozy and ‘real’ for the holidays. I don’t want it to look like the Christmas section of the nearest big box store blew up in my living room, rather, I want it to look elegant and almost like it could stay that way all year round and it would look just fine. You have done that here, and I love it! What a fun giveaway! Love, love, love the large glass lanterns. Thanks for introducing me to Mary & Martha. Love their stuff and will definitely be checking out their website! I recently discovered your blog and I just love it! I’m definitely inspired! Well, I know that I love all of the Mary & Martha items featured in your Nesting article, so I cannot wait to click through and perhaps do a little Holiday shopping. You home is so lovely during normal times of the year, but truly cozy and “ahhh” worthy now! Would love to shop at Mary and Martha! Beautiful pieces! Mary $ Martha? I can’t wait to stop over and start my holiday shopping. Thank you! I love the scripture pendant on the lantern. My daughter has just begun to read and I have been meaning to incorporate more scriptures in our home to nurture her young faith and edify us all! Love the lanterns! Hope to recreate the look! Love the lanterns! They are so beautiful! Everything looks so festive! Love the lanterns! You have fabulous taste, I love all of the fresh greenery you’ve used especially the little evergreens in galvanized buckets over your sink! Your home is BEAUTIFUL! Thank you for sharing these wonderful, classy decorating ideas. I can’t wait to get started! I would love to receive some of these gorgeous and super cozy pieces! 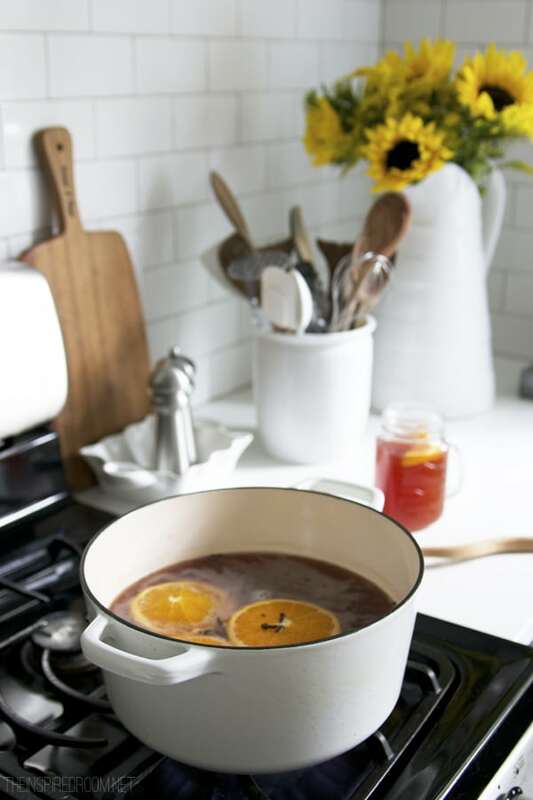 Love the mulled cider – everything looks so cozy and welcoming! Love those trays! AND I’m a mug collector…..all of which qualifies me to be the winner! Ha! Thanks for the fun chance anyway, Melissa, love everything I see, as usual. I love your blog! The lanterns are beautiful…. I would love to win! I so look forward to your emails with wonderful pics and decorating ideas. I would love to have any of those items to help spruce up my new house. Love your blog!! I love your blog Melissa and I love Mary & Martha too! What a blessing in our homes. My favorite of the featured pieces are the lanterns, they are so elegant. Love them! Thanks for your blog, keep up the good work. Your blog makes best rest a bit more bareable! I’m excited to go check out Mary and Martha!! Thanks for sharing! Your home is gorgeous! Could you tell me where your wicker dining chairs are from? Thank you! They were from World Market a few years back, but sadly I don’t see them in stock anymore! Oh well, I’ll have to keep an eye out for something similar. Thanks for replying! I love the simple elegance of your holiday decor. I think I went through a tacky phase (wish I was joking! )and you’ve inspired me to simplify, using fresh evergreens and that Christmas red. I love that you really use what’s in your home and just add or relocate to freshen up the whole room. Thank you for sharing and inspiring me to surround myself with things I love! That is A LOT of free items! Mary & Martha is so giving, love this company! Good Luck everyone! I enjoy your blog so much. It inspires me with great ideas and helps me get the “get up and go” I need to start decorating. Also, love your style. Thank you so much for sharing your beautiful home. Everything about it says cozy. The Mary & Martha items fit perfectly too. Beautiful. Have added Mary & Martha to my favorites! Such lovely inspiration! I really appreciate you sharing your creative ideas!! I LOVE The Inspired Room. You truly do inspire. I can’t wait every morning to check my emails and see what is new on the site.It brings a smile to my face when I have had a rough previous day and it brings me joy to look at beautiful images of the home which inspires me even more to work harder towards owning my own home one day. Love your home and am look forward to seeing it decorated for the holidays! I would love this !!! You do awesome !!! LOVE the way you decorated your home. Beautiful! Thanks for sharing. You have a beautiful home. I want to go home from work and make pumpkin squares! You website and your home are so inspiring but especially this time of year! I love how you can “feel” the welcome of your home! Very pretty! Love this time of year for the “nesting” as well! in keeping our home cozy and familiar, yet new and interesting. Beautiful products– I love the lanterns! Thank you for sharing all your festive holiday touches with us today. Your posts have gotten me in the holiday spirit! I am ready to begin decorating my home and preparing for many holiday visitors. I would love to win the great items from Mary & Martha! Thank you! I love the vintage announcement board and the new Christmas tiles that go along with it! Mary & Martha has beautiful products! Thank you for sharing. Love the comfortable decorating ideas! Candles are pretty and “safe” in glass~ and I spotted a lamp made from a large glass bottle…. I have one and need to create a lamp for my living room! thanks and Happy Holidays! I love reading your blog. You have given me so many ideas for my own home. Glad that the emails are coming again and I’m looking forward to receiving many more. Your pictures truly are inspiring & peaceful. I like your Mary & Martha items & didn’t know about them til seeing them in your posts. I don’t often have time in my hectic week to read your blog, but when I do – I’m instantly transported to the beautiful world you live in through your amazing photographs and styling. I dream that my home can look like yours someday! I love the lanterns in your home. So glad to be receiving your email updates again. I LOVE the Mary & Martha products! I would be honored and grateful to win your contest! I love all the Mary & Martha items you’ve showcased! Going to use the link provided and head over to all the other pretty things for sale on their site! My favorite time of year too! Love fluffing up the house & getting creative! Thanks for all the beautiful inspiration! Your simple style is inspiring. I love to read about Mary and Martha in the bible, each woman had inspiring gifts and it’s a fun name for a company. I do love the & tray. What gorgeous items! Enjoy your site….and Jack’s blog! Thanks for sharing yourself with us! Thanks for the amazing introduction to the Mary & Martha site! I am so excited to have found it! I would be delighted to be the winner and proudly display her amazing decor. Thanks for being one of my favorite sites! I love your blog and love your emphasis on simplicity! Your home seems so warm and inviting and your blog gets me excited about simple decorating as I get ready to have family over for the holidays ! You are the only home decorating blog I read! Many blessings to you!! Love your blog! Beautiful home! Thanks for introducing me to Mary & Martha. I love Mary & Martha, they have such lovely pieces! Thank you for the opportunity to win these items. They are all lovely and functional. Love your blog. Thanks for the inspiration! Yes, please. Love the nesting/ homey photos. I’m new to your site and eagerly scroll through first to look at the pictures, then leisurely read through your posts. Thank you ! I love your home and its simplicity! Thanks for the inspiration to fluff our homes and invite guests in for the holidays. I love doing that too and I’m going to try your cider recipe. 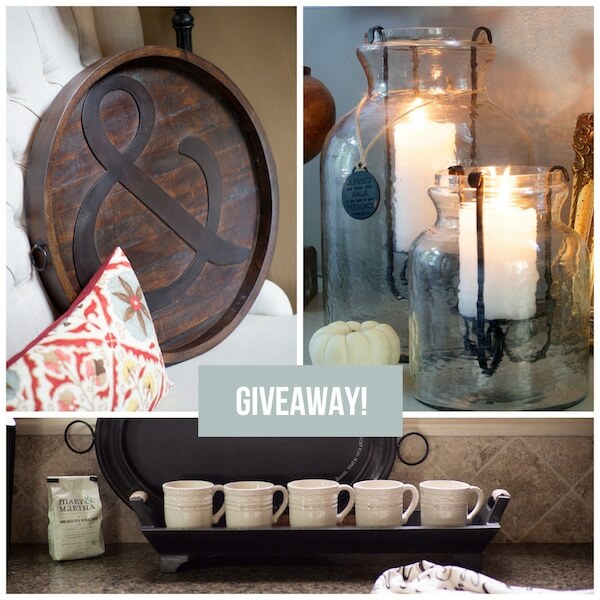 I love Mary & Martha stuff – So I am very excited for this giveaway. Thanks for the chance. I love those glass lanterns – beautiful! Please choose me. I love the pictures! I’ve never hear of Mary & Martha, but I absolutely LOVE them now! What beautiful things! Thanks for introducing me to them…and thanks for a fun giveaway! Thank you for all your inspiration, Melissa. Both my front hall and my kitchen are grateful for your style! Thank you for the giveaway! Simply gorgeous, understated, clean design. I love your festive, casual elegance! Your home is beautifully decorated, without feeling fussy. I have that beautiful chalk tray and it is one of my favorite pieces in my house. I have been drooling over those other pieces. I love the inspirational sayings with them. Merry Christmas! Thank you for opening the door to your darling home, and welcoming us all in like old friends. Your blog is a delightful treat when I turn my computer on every day. I adore how you decorated your home for the holidays last year, and can’t wait to see what you have planned this year. All the best from a new fan! I can’t wait to go shopping at Martha and Mary. I love that name and all it speaks to. I also love your kitchen window. Mine is my favorite view in the house. A bible verse on my new little stand (still trying to find the perfect cards to use), a tiny vase from a dear friend with a few greens or blooms from my yard, pretty curtains and the view from the window is my memorial garden to my mom. 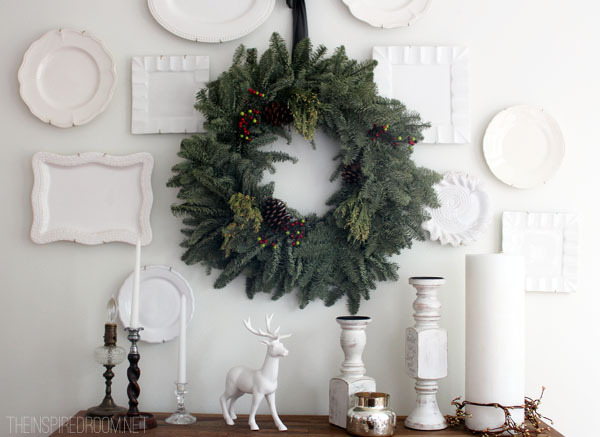 I love all of the fresh decorating ideas (not your typical reds and greens) for the holidays. It makes your home feel so comfy and cozy when the holiday decor easily blends with the rest of the house. Thanks for sharing! I have really enjoyed your email with ideas and pictures. Your home is great and those lanterns are to die for. I love how every room has Christmas touches in it. Also, the beautiful uncluttered decor. I always enjoy the beautiful photos of your home. Thank you for sharing and for the opportunity to win some great giveaway prizes! What an inviting style. Would love to see it in my home too. Will have to check out Mary and Martha. Enjoy your posts-your home is lovely! Love the items from Mary & Martha-I hadn’t heard of them so excited to shop with them! I love decorating for this season also! Love all of your wreaths! Love your blog and style of decorating! Thanks for all the helpful tips and the wonderful giveaway. I love your house!! I’m gonna go shop Mary & Martha now! Love, love, love the lantern! Also the blue and white fabric on the footstool tucked under the table. Source? Love all the special touches in your home! The Mary and Martha give-away is icing on the cake! once again such beautiful things…. and that pumpkin cake recipe is TO DIE FOR! I made it last year and I will be making it again…it was a hit! Oh my gosh I LOVE all of these items! Thanks for the giveaway. Happy Holidays! I totally love the handblown glass lanterns! Beautiful! Thank you for the inspiration and offering such a neat giveaway! forgot all about Mary & Martha’s stuff till reading this today. Your posts always leaves me inspired to go get all the things I love out of the closet & USE THEM! Thank you for all the decorating tips! Your house is beautiful! Count me in Melissa, I would love to win those items! Thank you for the giving me inspiration today and having such a neat little giveaway! Your home is lovely and I love that tray! Your cider recipe sounds really yummy and you shared other great ideas. I have had my eye on that Ampersand tray for quite a while! Just the inspiration I needed today – recouping from knee surgery won’t stop my Christmas decorating & online shopping at Mary & Martha! Everything is beautiful. I love your blog. Your home is always so inspiring! I love your home. It has inspired me to declutter and begin my holiday nesting this year. I would also love to add the Mary and Martha items to my décor. Thanks for all you do. I love all of the white you use. Thanks for your wonderful blog and book! I don’t have a lot of extra space in our coffee station for mugs but those look like they might just be narrow enough to fit! I look forward to reading your blog every day! I can’t wait for your book to come out too! I love your house, and I love Mary & Martha! Thanks for sharing such creative and fun ideas on your blog and for the opportunity to with these wonderful items! Your home is so inviting! Thanks for sharing. OH … what a delightful opportunity in which to share the inspiration! Thank you for showcasing Mary & Martha on your site. I’m already a BIG fan! The photos don’t do the products justice. They are wonderful and really make a home beautiful. Want to house swap for the holidays? ;) Once you’ve finished decorating of course. Thanks for giving me a glimpse inside of your inspiring home. Simply Beautiful. We have very similar tastes in decorating, although you do a much better job with it than I do. It would be so fun to win some new treasures. Love the lanterns from Mary & Martha. Also, love the cider recipe and plan to make it ASAP! Your house is simply lovely and so inspiring. Thanks for sharing. Your house is just SO cute! I love that everything is kind of clean and basic, but so easy to switch out and dress up. Thanks for sharing! I’m looking forward to simple entertaining as well. I love the pictures, they are beautiful & inspiring. One of my nesting favorites is cider, i too love the aroma of this delicious drink. I also like to do a harvest & Christmas boil (potpourri). I love the Mary & Martha items and the scripture and inspirational messages that they allow me to share in my home. Your home is beautiful! First time visitor to your blog, it will not however be the last! Very nice ideas and so warm and welcoming! Looking forward to more! Hello! I really enjoy your website as I need all the help I can get. Thank you you for introducing me to Mary and Martha as I feel their items are something that will bring intentionality and focus! Love your blog! Beautiful decor inspiration. Your home ready does inspire me. I appreciate the way little touches come together in a warm way, and I plan to do a little arranging today. I really love the glass lanterns and the way you grouped them. One day I was perusing Pinterest for some inspiration for my future kitchen when I came across your blog, I am in love with the sink, tile walls and no cabinets above the counters! I so enjoy the photos and other ideas you share. Thanks so much! I adore Mary & Martha products! You have decorated your house beautifully w/ some of my favorite items!! What an awesome idea to have a giveaway as well! I especially love the chunky candlesticks. This is so apropos today, as we in Michigan are nearly snowed in! Decorating for Christmas is definitely on my mind. 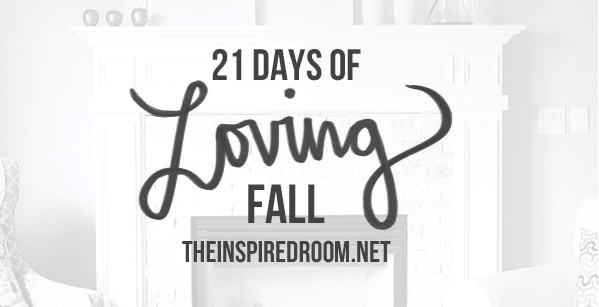 The Inspired Room is my favorite, favorite blog! I always find inspiration in your work. Bravo! I am so thrilled that the holiday season is upon us. Yesterday, I spent the afternoon changing over my decor to more winter inspired things… It felt so cozy and relaxed last night here! What a great giveaway! As I was looking I was thinking about DIYing the oval chalkboard tray. If I win that won’t be necessary! Thank you for your beautiful inspiration, and thank you for the opportunity to win some beautiful treasures! and this Christmas is the first time in 15+ years that our families will be together over Christmas. Yay! For Her! Love & Thank you! 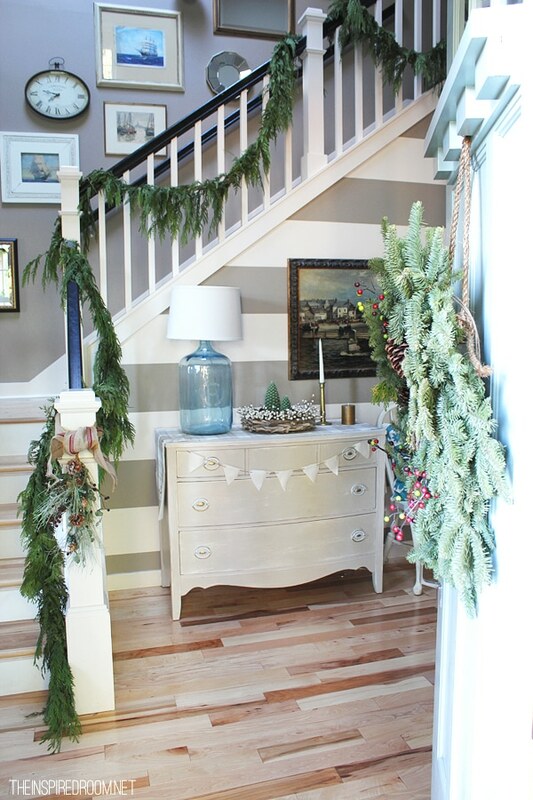 Loving the combination of rustic cottage-inspired decor witha holiday theme! I would really like to know where you purchased the copper-topped lantern-like light fixture. Also, I work with different fonts and design and collect objects with ampersands. Really like the ampersand platter. It is an outdoor lantern from Pottery Barn :-) Thanks! I’d love to win the items from Mary & Martha. They would be great for entertaining for the holidays! So inspirational! Love the little tree in the burlap sack! How adorable everything looks! Love the little trees at the kitchen window. Love this generous giveaway! Thanks for sharing Mary&Martha with us too. Some nice things for sure- love that large ampersand plaque- many lovely things besides! I LOVE your wicker chairs! I can’t seem to find them anywhere – they would look great at my house. New subscriber to your blog – very inspiring and fun! I LOVE your bog! So inspiring to me! Just recently discovered your blog and I enjoy so much falling into your inspiration. Oh my goodness! I love that tray!! I love Mary & Martha! Your home has me excited for the holidays! Love your décor style! Thanks for hosting such an awesome giveaway! Thank you for such an inspiring blog! You have reawakened me to the joy of nesting! You have a most beautiful home Melissa. I am definitely going to visit the Mary & Martha website. Thank you for the wonderful giveaway. Happy Holidays to you and yours!!! I love the Mary and Martha items! Specially the hand blown glass lanterns! Love what you’ve done with M&M products! I’ve missed your posts so I’m really glad to be able to read them once again. Your home always looks stunning and the flow is just right. It appears to be so relaxing even though you have your large bundles of joy to contend with. Love your blog. I am looking forward to making your cranberry cider recipe. Thanks for the giveaway. What is the definition of nesting?? I love your home – gives me great ideas to do in mine. Thank you for the giveaway! Glad to have your email updates again! Loving your holiday style, I’m inspired to start some of my own! I’m so excited about decorating for the holidays too. Even though our space is pretty limited on our down-sized house, I love making things cozy and festive! Thanks for hosting this giveaway! I adore the Mary & Martha line and decorating for Christmas. It is wonderful! I love everything in your house and I love your posts! Thanks! Love love the great ideas. The chalk tray is soo cute. I am inspired to start that holiday decorating earlier. Snowed in in Bflo, NY. I love all of your accessories and how it all comes together!! Love your ideas for entertaining during this season, I agree, autumn is the time to begin nesting – and that’s so cozy! Your home is lovely, and the Mary and Martha items add to the charm. Thanks for offering the giveaway. The blown glass lanterns are fantastic! I enjoy reading your blog, you have been the inspiration for many updates to my own decor. Thank you for the chance to win! I love your decorating ANY season. The Mary & Matha accessories are perfection. I can’t wait to see the new holiday decor and colors you have planned! Your simplicity is perfection! As always, my fav! I’ll definitely be checking out Mary & Martha (I have two sisters by those names). I love the mugs in the holder. I really enjoy reading your blog. Happy Thanksgiving & Merry Christmas to you and your family. LOVE LOVE LOVE!! These would look great in our new home :) Thanks! You are one of the few blogs I read. I love your home and the quiet beauty it exudes. I am striving for that in my little house I just bought for my daughter and I. Thank you for sharing and the website has pretty items! Thank you for sharing your home with us! It is really lovely and very warm and homey. Great ideas and I hope you don’t mind if we steal a few. I am filling my home with “repurposed” furniture and love to see how you have placed yours. Your Christmas pics make your home very inviting !! Such beautiful inspiration for the holidays! Love your style and love your blog! This is our first Christmas in our new house and I am excited to decorate for the holidays. Your beautiful home is such an inspiration!. Your home looks so peaceful and inviting. I love the lanterns and the trays. They are so versatile in decoration. Thanks for sharing your beautiful home. I was debating whether I should start decorating my house for the holidays, and now I am very much convinced. Your home looks lovely and is inspiring me to get the nesting going. Love the glass candle holder, they would look wonderful in my new home! I would add a sprig of pine branch to it, the heat from the candle would make the room smell of pine and a decoration for Christmas! Thank you–I so enjoy all of your decorating advice and inspiration! I love the simplicity that you decorate with. I am relatively new to your blog, and I love clicking on to your site. You have really given me confidence in decorating and being me! Those are beautiful!! Count me in! You’ve inspired me to change so much about how my home is decorated since I’ve been reading your blog. I’ll have to send you some pics to show the changes I’ve made. I’m simplifying so much and getting rid of tons of clutter. :-) Thank you for the inspiration! Love all of your beautiful room designs, Happy Holidays! Love nesting this time of year and changing up decor. Mary and Martha pieces are beautiful! As usual, your home is so beautiful! Thank you! Their stuff is beautiful! Love your blog!!! I am really coveting the glass front cabinet in the reading nook area in your home. May I ask the manufacturer or where you purchased it? Happy Holidays!! Just love these beautiful lanterns, tray, and cups from Mary & Martha! Thank you for sharing your home with us! Melissa, everything about your home seems to say come on in, I’ve been looking forward to having you stop by for a visit. If you can achieve that, I think you’ve reached the ideal. Even though it’s not your house, don’t I just love that bright green kitchen stool! What a great shot of color. I love Mary & Martha products. I would love to have all of the dishes and serve ware, but my favorites are the hand blown jars!! I love the glass lanterns! Such a cozy and beautiful home! I love the rustic, warm winter decor. Beautiful home! Fall and winter, what better combination warm drinks and candles to welcome family! Your house just says welcome! I love it Melissa! And the Mary and Martha goodies are beautiful. Love to win! Especially that chalkboard tray! Would love to win the beautiful mug set and glass latern. They say to me come on in and make yourself comfortable and stay awhile. Ps what is a URL number? I love the looks in these photos and love you for offering the chance to win these little treasures for the house. Your home is so welcoming! Love your blog! I enjoy your home. Not a lot of fuss simply beautiful! I love the beautiful glass lanterns and am looking forward to trying the cranberry cider. Thank you for the recipe. Mary and Martha are beautiful and classic pieces. Thanks for having the give-away! so pretty, love your style. thank you for the chance! Thanks for sharing your beautiful home with us.The ideas you give me are crazy good. I think the Mary and Martha items are just stunning. Thank you for sharing your beautiful home with us and those precious dogs!! Thank you for sharing the Mary and Martha give away pieces. Would love to enjoy coffee with friends and family with the mug/tray set. Your home is beautiful. Thank you for sharing! Always love your sense of style and your comments. Serenity comes to mind when I view your site. Thank you for the inspiration! Just love every chance to see your amazing home! One little thing stuck out for me today……the towel over the basket by the sink in the kitchen. I love that idea!!!! I LOVE the glass lanterns! BEAUTIFUL! I always enjoy reading your blog, and looking at all the inspirational pictures you post! You’re amazing! New to your blog. Enjoyed your post. No-fuss entertaining means more time to enjoy your guests! Right on! What a great way to start the Holidays. I love your decor. Congrats on your book(s). How exciting. Love all of the Mary and Martha items. Happy Holidays. What a fun giveaway! I would sure like to win. Thank you! I loved your post today. It gets me in the mood to nest myself and put out a few decorations. I loved all of the Mary and Martha purchases you have acquired. Thanks for hosting a giveaway! I am really enjoying your posts! 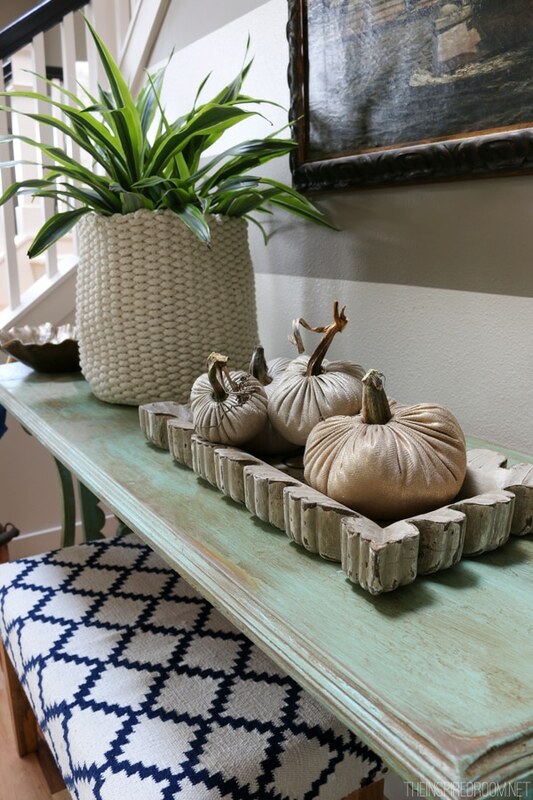 Fall/Winter are my favorite decorating seasons & I love all of the little touches you add. I will definitely be incorporating some of your tips into my home this year! The lanterns are soo amazing! Itis so Beautefull. All I wish was to have this in Brazil. Thanks for sharing. I love your beautiful yet casual home! Just the way I like mine to feel. Love the Mary & Martha selection as well! We are avid tea and coffee consumers during the fall and winter months. Love the Tea for Two tray and accessories. Another display of your talents. Thanks for sharing them! What a beautiful home you have! I absolutely adore the handblown glass lanterns. Gorgeous. The pictures of your home are beautiful! Thanks for posting about Mary and Martha. Love their site! Love the glass jar candles & the stools.. so happy! I love how all your colors POP due to the vast amount of white background in each room. I am a die hard fan of reds and they work in many seasons along with Christmas (valentines’ day and fourth of july). Yay! Enjoyed this blog and would LOVE to have one of the glass lanterns!! Your home is so beautiful. I love everything you’ve done to give it such a warm, happy vibe. Thank you for sharing that you make entertaining laid back, we tend to lose that around this time of year with the hustle & bustle of the holiday season . I love all these items and the way you display them in your home is lovely! I can’t wait to start my own holiday nesting! Love your fall staircase and LOVE that M&M wood tray paired with the velvet pumpkins!!! Swoon! Love seeing all the little touches you do for the holidays – so much fun! I am thrilled to see how you have nested the Mary&Martha products in your home! So elegant and peaceful. Anyone who walks into your home would be inspired by the messages that are shared on these products. Love it! What a perfect way to celebrate the true Light! Thank you for the opportunity to win. Love all the Martha & Mary pieces. Inspires me to decorate for the holidays! I love Mary & Martha and have always wanted something from them for my home!!! The ampersand is one of my favorites!! love your blog–always great ideas! Love your beautiful home and how you have decorated for the holiday season! Your wreaths are gorgeous did you make them your self? If so can you write a post with a tutorial? Thank you for pointing out where you get some of your great pieces. I always wonder where they were found. Now I know – Mary & Martha! Thank you! I love the cute little trees on your sill above the sink. Thank you for sharing a website (Martha & Mary) that I didn’t know about and can now peruse for thoughtful gifts.I love the teacups in the tray! Love the small but striking and beautiful holiday touches! So I just found your blog today and I’m in love! I love how you use pops of color here and there. Thank you for sharing your home with us! Very nice giveaway. You have a beautiful blog with a lot of class and yet simple. Thanks for all your great ideas and inspirations. I really love the accessories, they bring such a wonderful warmth to your space. What a delightful giveaway. I would be able to put everything to good use. LOVE!! Hi Melissa, this is the first time I leave a comment but I have been following your blog for almost a year now. We bought a new house 7 months ago and I am adding my personal touch little by little. Visiting your blog is always an inspiring and relaxing experience! By the way I am getting your postings delivered to my e-mail again. So, the bug is fixed! Thank you! Yay! Thank you so much :-) I’m glad we are reconnected! And, Melissa, you have a wonderful home. I love getting ideas from your blog and LOVE this giveaway! Thanks for introducing us to a place to get beautiful and timeless accessories for our homes. Thanks so much for the beautiful images – your home is so lovely and cozy. I agree with you and love decorating for fall and winter seasons. I can’t wait to see how you decorate your dining room! I love your chunky tray and glass lanterns – so pretty! Such a nice giveaway. Thank you! Getting ready for the holidays is always so fun. Love those lanterns! I love how you made it seasonal without allowing it to look like Christmas threw up! Beautiful! The lanterns are my favorite! What a nice surprise: a lovely giveaway! Who wouldn’t be happy with this delightful assortment? I’m new to your blog & I love everything I’ve read so far! Thank you for sharing your home with us! I can’t wait to see how you decorate for the holidays. I also LOVE decorating for the holidays! Creating space for family and friends to enjoy each other and celebrate the holidays! These accessories are perfect for creating that space! Love your blog and I also decorate with meaningful things! Some new things from Mary and Martha would be most welcome! I am new here and I love your blog. Thanks for all the great ideas. Wow! So many comments already! I don’t think I will ever win, and what’s more I probably don’t qualify as I live in France… Anyway I thought I would take this opportunity to tell you how inspiring your blog is! As always your house looks great! I just love all the M & M items from the ceramic cutting board, to the table runner and the lovely home decor. You are so generous – thanks! As a fellow Portlander I’ve been cheering for your blog for a long time, and have been inspired by so many of your ideas, and in particular, your sense of hospitality. That easygoing feeling of welcome is what I sense in all of your posts and is my goal in my own home! The Mary & Martha collection is thoughtfully curated and versatile – thanks for the giveaway! Such beautiful products! Would make nesting a joy. Well these trays are delightful. I’ll have to check out more Mary and Martha items! I love your home and am so inspired by your blog. Can’t wait to check out Mary and Martha. Thank you for the introduction. Your home is so lovely. You have a flair for making your home warm and cozy as well as beautiful. Wonderful job. Love, love, love your home! Makes me “homesick” wishing I was there! I must get your book maybe that will cure me. Thanks for all you do! I look forward to seeing what you have posted every day! Can’t wait to try the cranberry cider! Sounds great! Your blog is my new favorite to view for decorating ideas and inspiration for loving and living in my home :) I’ve not heard of Martha & Mary until today and am eager to view their site – thanks so much for this opportunity to add some new beauty to my home! Your home is so lovely! Thanks for hosting the giveaway. Love these Mary and Martha items! I love looking through the images in your home. Great design inspiration for everyday people. Thanks for the opportunity to win these great items. What lovely photos of your home. Wouldl love to win! Such beautiful pictures! I love the simpleness, so light with pops of color! I so look forward to your blog! Very inspirational! I LOVE your blog. You truly inspire me with all your design, decorating and sensability! I so enjoy, as you do, changing the look of our home with the Seasons and it’s a good way to do some thorough cleaning at the same time. Thank you for sharing all your ideas in helping others to live life beautifully and to surround ourselves with what we love. I enjoy your blog. Thanks for sharing your home with us. I especially love your kitchen and pantry. oh, and the map wallpaper. Thanks, too, for your enthusiasm for the holidays. It’s contagious! Beautiful, love all the photos! Thank you for sharing! I would love to add some Mary and Martha to my home. I have visited the site often but never taken the plunge! Thank you for the chance! Your blog today is so lovely…. your home just begs visitors to come and sit in your cozy beautiful spaces! I will definitely go visit Mary & Martha now after seeing your gorgeous items from there!! Thanks for the giveaway too! I love your blog! You truly have a beautiful, inspiring home! Timeless and elegant! You give me great ideas! I love how you beautifully displayed your Mary & Martha decor! Mary & Martha really has some unique and classy items. You have used them beautifully around your house. I would love to shop at Mary & Martha for some of my Christmas gifts! Love the handblown glass. Visit your site almost every day for inspiration! Thanks for the great work and for the opportunity to win a Mary & Martha item! Love your blog & home. Thank you for allowing us to be a part of it all. Mary & Martha has beautiful items! I am new to your blog and I am loving it!!! The Christmas touches are beautiful and doable, can’t wait to see this year’s:) the giveaway is awesome!! Thanks for the chance!! Enjoying your blog! Where are the glass fronted cabinets from? I love the glass lanterns! Thank you for the chance to win this amazing giveaway. I love your fall series by the way. I love your blog and all of your decorating. Your home is so warm and inviting. Thanks for sharing it with us. I adore the glass lanterns! Beautiful! Thanks for the chance to win!! Love those lanterns! So pretty. Congratulations on the BHG feature! I often read magazines back to front, so when I got to your feature, I thought, “I’ve seen this house before!” Then realized it was yours! Love the glass lanterns!! Beautiful photos and inspiration. Mary & Martha is unique. Your blog is always a breath of fresh air. And since you live in such a beautiful state, I can understand why you enjoy decorating for the holidays this time of year: it always smells like Christmas there with all those giant fir trees everywhere! Have never heard of Mary & Martha but love what I see in your home. On my way over to check out their site. I love and appreciate the inspiration you share. Happy Thanksgiving and Merry Christmas. In the middle of a move this holiday season so I appreciate a few simple tips I can incorporate and put me in a celebratory mood! Cranberry cider sounds heavenly! Love your blog! Great giveaway too. Can’t wait for your books to come out. Pops of red are SO festive. We do the same thing and I always miss it come January! That first picture was so inviting! Visitors to your home are very lucky. Love the Mary and Martha items. I have ivory stoneware that I use for everything. The set is so perfect. Happy Thanksgiving! Love your blog and home! Also love the Mary & Martha items!! Love the Mary and Martha products. Thanks for sharing with us and I love Martha & Mary products too! You absolutely have the perfect name. I AM inspired!!! Really love the simplicity of your blog! Thank you for sharing such cozy ideas! Wow what an inspiration! O love give aways ! Thank you! What beautiful things to choose from! Great giveaway. I love beautiful things and clever words! The Inspired Room give me that every day! Love……….. I was able to see much of the Mary and Martha line at the Allume Conference and fell in love with it! Thank you for your simple attainable design sense. Less is proven to be more in your beautiful inspiring rooms. Your blog is inspiring and makes me think of new ways to use unique pieces. you have inspired me to purge and nest to get ready for christmas decorating! Beautiful inspiration. I absolutely love the lateens. I just love your blog and your beautiful photos. Your photos give me such inspiration. Thanks for the opportunity to win such gorgeous items. Look forward to your blog every day! Love these items! You always have the neatest accessories in your house, and I always enjoy seeing your house. Beautiful and inspiring ideas on your site! Lysa Tyrkeust;s book ‘The Best Yes’. SO Good! The Mary and Martha products are gorgeous! Oh my goodness…..I stopped halfway through your post to go look at the Martha & Mary website. And then to read to the bottom to see that you are sponsoring a giveaway? Wow! Would really love to win this – everything is beautiful! I loooove the beautiful lanterns! Thank you for opening your home to us, I love to see what’s changed! Love all the Mary & Martha touches! Oh, oh, oh……I just love everything! I’ve loved your blog for years. Haven’t commented much the past few years, mostly a lurker once a month or so. Life just gets busy and I don’t read or blog the way I’d like. Thanks for sharing about the Mary & Martha items, I’m off to shop the site! Also, we are picking up our goldendoodle next week, eeeek!!! So excited about meeting our sweet new girl, Daisy. Love following Jack on FB. I absolutely love your blog. It’s simple yet very classy and sophisticated. Thank you for introducing Mary and Martha product line to us. Beautiful, classic pieces that can be used year round. Loved it! I love how cozy your house is. Mine is not there yet but I’m working towards that goal. Ooooo! I am so ready to start decorating for Christmas! Thanks for the inspiration and the eye candy! I love the blog and I love the products!! I hope to win. Its hard to know when to be a Mary and when to be a Martha……. Love the blog. You always inspire me! My daughter just recently told me about Mary and Martha. Wonderful items and what great gifts! Love the hand blown glass lanterns and I love your blog! I love your blog and your decorating style! I love your blog and your home. You’re an inspiration! Beautiful as always! Thanks for giving me some fun ideas. You’ve inspired me to do some nesting around my own house, so beautiful! You make me want to run up and organize my closet right now! Love your home. Your house is so warm and charming. I am in love with those lanterns. I enjoy reading here and I’m looking forward to the book(s)! Happy Fall! Love your blog and your book! Thanks for the nesting inspiration–simple and lovely! Love your blog and I’m going to the Mary and Martha website now to browse. Just found your blog and I am loving going through old posts! Loved this post! Great idea for a hospitality station. I am sure your little gatherings are truly spectacular. Will look forward to seeing your holiday décor this season. I always enjoy your posts. This cold weather is really bringing out the nesting instinct. Thanks for the inspiration. Love everything in this post, time to start decorating! What a great opportunity to win some really lovely gifts. Thank you. I resently found your blog and started following it. We are now homeowners and always looking for inspiration to make it our own cozy place. Love your website! Always enjoy seeing your pictures. Love it! I love your style and your home is beautiful! Thanks for sharing it. Your home is lovely…..so inspiring! I love your festive, but simple holiday touches. I’m inspired how you’ve made your home look Christmas-y, but not over the top. Can’t wait to see how you pull it together this year. Also, just love your kitchen renovation! Thanks for introducing me to Mary & Martha site. Love their deco pieces. Going to check out their website. I love the two lemon Cyprus in your kitchen window. Did you have any difficulty taking care of them? I have one in a container by my front door and it has begun getting brown on the edges. I’m not sure what I’m doing wrong. Your home is beautiful, and would make visitors feel so welcome! Love the items from Mary & Martha! I love how you have your home decorated! Also, I have had my eye on the “&” tray for awhile now! Hi Melissa, Reading this post, I had a serious case of house envy, which I had to quickly stifle. Your home is beautiful–and getting prettier all of the time. I live in a very small home, with no dining room–but it’s paid for! I’m grateful for God’s blessings. Thanks for this fun giveaway. I especially love the lantern. I think I’ll head over now to check out Mary and Martha. Thanks again. I think the glass lanterns are so lovely. I think candles serve as a wonderful reminder to soak in the moment and slow down. Thank you for sharing! Thanks for sharing your creativity, for introducing us to Mary & Martha, and for the giveaway opportunity. How fun! I was invited to a Mary and Martha party earlier this fall. So many beautiful items. I especially like the candle lanterns. Love your site, so inspiring! It’s that time again. I just finished decorating my house and wrapping gifts this weekend. I’m going in for surgery the beginning of Dec. so I have to be very organized this year. I love the all the simple touches you add for that cozy feel. Mary & Martha have such beautiful decor items. No wonder you have several throughout your house. Every blog of yours makes me look at my house with fresh eyes. That can be good and bad!! It gets my decorating mind going and sometimes simply moving things into different rooms changes everything! Thanks for your inspiration. I am new to your website and really enjoying all your fresh ideas. Your home invokes such a feeling of serenity! 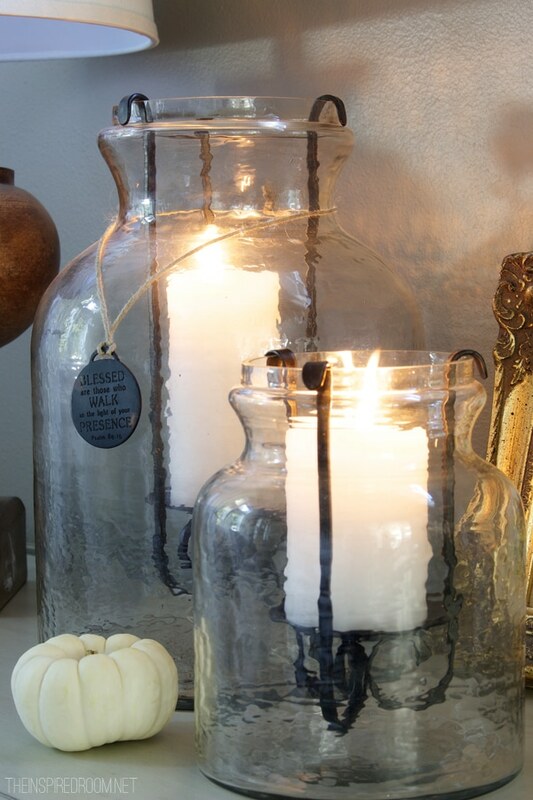 Thank you for sharing the Mary and Martha website….love the beautiful glass lanterns. Other than when my one of my four sons emails me, receiving your blog is my favorite email to click on at the end of the my day! When I see it come in my “in” box, I smile because it gives me incentive to get through my work related emails so I can sit down with a warm drink (currently it is cider), a sweet treat, and read about the different projects you are working on or admire how your display your beautiful things. You are down to earth, humble and I never feel intimidated that since I don’t have the gift of decorating, I’m not ‘welcome’ in your home. Thank you for brightening my days. I missed the emails the past several weeks-so much that I thought I would comment here to let you know how much I appreciate your blog. Thank you for the inspiration. I like the small weath in the kitchen window. I’m motivated to start nesting in my own home now. I’m due for a little freshing up. Love this collection and hope to win!!! What beautiful ideas you have for us. I love the lanterns and thank you for the giveaway opportunity. Your beautiful home is so inspiring, thanx for the giveaway opportunity! I love the simple but oh so lovely and festive decor. Must check out Mary and Martha to see what else they have. We are going back to basics and simple…lots of red and plaid. Okay, more than usual and less fussy. Can’t help myself! I feel inspired and look forward to the day after Thanksgiving! I love Christmas. Thanks! i can’t wait to try the pumpkin squares recipe. Thanks! I cannot wait to read your book!!! Hard to imagine the holidays are upon us! I always love your home, no matter the season. It is creative, and it inspires me. I am excited about Mary&Martha……. Thanks for sharing your great ideas AND sources! I absolutely love your decorating ideas! When your e-mails weren’t showing up in my inbox I really missed them and am so glad that the glitch was fixed. All is well…. Heading over to check out their site now. Thanks! Always enjoy your posts! I just discovered Mary & Martha and would love to win a treat! Such great taste and such great pieces. Thank you for the inspiration! Family, Friends, Festivities. I would love to have these gifts for holiday gatherings! I had already clicked over to their website to check out the pretties before I finished reading the whole post, so I was super excited to scroll down adn see the giveaway. I hope I get picked! If Mary and Martha would bring some warmth and coziness into our home, that would be wonderful! Love reading your blog. Good luck with your books. Love the dark Christmas wreath against the white wall. Love the pop of color with the red bows! Thanks for inspiring us to make our homes beautiful for our families and all who enter! Thanks for sharing. I love that tray!!! Your home is so beautiful! This giveaway is awesome – love the Bible verse attached to the candle! Oh, that stool with the green legs is sweet. I love lusting after all the adorable things on your blog. Thanks for the chance to win. Your giveaways are amazing! Sure don’t find stuff like this in my neck of the woods (southern Ontario Canada) It would truly be one of a kind in my home. Thanks for opening your home to us and passing along some great ideas! Everything is beautiful! Thank you for the inspiration always! Hi! Please enter me in the drawing!! Your giveaways are amazing! I sure don’t find stuff like that in my neck of the woods (southern Ontario Canada) They would truly be one of a kind in my home. Thanks for letting us into your home and sharing some awesome ideas. I like my stuff but I like your better–makes me want to start decorating all over again! Beautiful home. Love the lanterns. Love your blog and your home is lovely. Thanks for the giveaway. I adore that little chalkboard home sign. What a fun little kitchen it sits in too. You have a beautiful home. Thanks for all the inspiration!!! Beautiful! Your home looks great. I’ve really been enjoying your emails in my inbox. So glad I signed up! We just put subway tile in our kitchen and noticed all the lovely subway tile in your kitchen. Thanks for this great chance at the giveaway! I will be checking out Mary and Martha’s site, soon. So, so lovely. Last year at this time our home was under construction for a major remodel so we were cooking and living out of our dining room and downstairs powder room. Christmas breakfast was our first meal in the new space! We had lived in a cramped 1976 kitchen for 18 years and longed for some openness with simple lines. Finally the stars aligned and we were able to make this happen last year! Somewhere along the way I stumbled on Inspired Home and became even more inpired. The photos and products influenced our final decisions. (bamboo blinds, white subway tile, gray tones on lower cabinets) so now I type from our extended family room which is open, welcoming, and fills my soul with joy. Thank you Inspired Home and Melissa for sharing your ideas. I follow very few blogs but your’s is worthwhile and I always appreciate your sponsors. I just perused Mary and Martha and love how their products create a feeling a warmth for every day living. Love the tray with tea supplies on it. Now, that’s inviting! Thanks for all your great ideas. Love, love, love the feeling of your blog. Authentic, charming, and soooo appealing ! Fun too, and that’s important !!! Looking forward to your new books and thanking you in advance for sharing all you do with us :) The give-away choices are lovely !! Can’t wait to have them in my home. great ideas…can’t wait to get the house ready for next week! I love the glass lanterns and the big & sign – everything looks beautiful! Love following you!!! Thanks for always sharing your sources for beautiful things! What beautiful meaningful items. Thank you for the opportunity to take some home! Love, love, love your decor ideas! The glass hurricanes, tray and chunky candlesticks are awesome! I also really like your charcoal cabinets! So lovely! Would really appreciate the glass lantern to cozy up my home for the holidays and all year long. Your home is just my style. I love it! I so enjoy looking at your blog. It is filled with such love and thoughtfulness. I was also looking for a yummy hot cider so I am going to try yours! I love your blog. Your home is so cozy and inviting. These are all so lovely! It is so nice to get your posts in my inbox again. I so admire your decorating taste. Everything you put your hand to seems to leave behind beauty and purpose in your choices. Plus I love your minimalist style. The Mary & Martha items are so beautiful! I always leave your blog feeling so inspired! Thank you! Your blog is always so inspiring. I love Christmas too! The Mary and Martha items are wonderfful! It always a treat to visit your blog . . . love your home, love your style! I heart the lanterns from Mary and Martha :O) Hope you are having a wonderful holiday! I just recently found out about Mary and Martha. They have some beautiful things! Thanks for the chance. Love the & tray. Would be a perfect gift for my daughter in law! Everything looks so beautiful! It feels so homey! I’ve never heard of them. Looking forward to checking out their website and getting some new ideas! I am in love with those lanterns. So versatile and festive. After looking at the site I sent the link yo my husband as a small Christmas hint. You have put me in the mood to nest with all of your inspiring photos! I always love seeing your home all set for the fall and the holidays. Love the Mary & Martha lanterns…I can see why people are always commenting on them! Loved waking up to learn about Mary and Martha, thank you for sharing them with us! Your home and your blog are awesome! Love your holiday touches especially those lanterns. love, love, love Mary & Martha!!! Wow, so many comments! I have recently found your blog & I’m really enjoying it. Filling out my gift list from Mary and Martha will make everyone so pleased they will become new customers! I’m so glad I discovered your blog this summer. I love the feel of your house. I’m going to try your Mulled cranberry apple cider this Friday when a couple of friends come over. And now I have to go check out the Mary and Martha site! Your home is absolutely AMAZING!!! I would LOVE to win something from Mary and Martha!! I have a ton of amazing ideas to decorate my home, but can’t afford to put them into place right now unfortunately. I love your blog and always look forward to your emails! 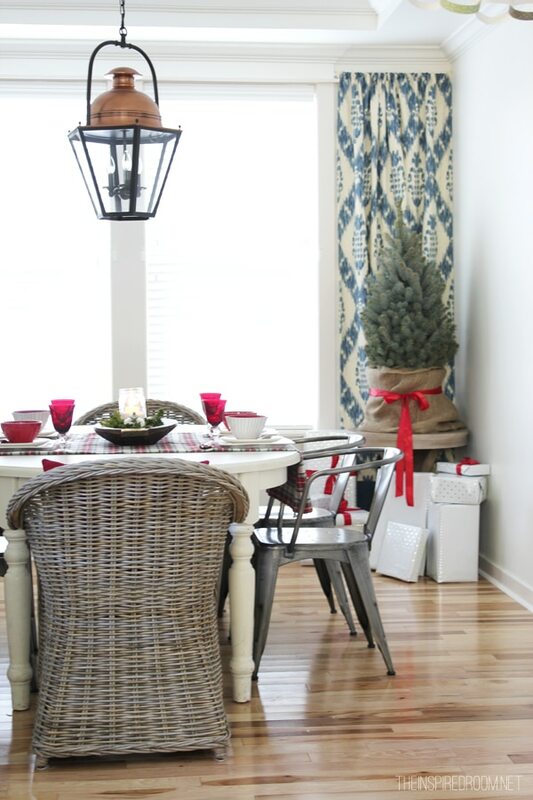 Love your light and airy home, and the way you use every day items to spruce up for holidays. Heading over to check out the Mary and Martha site. I love how warm and inviting you make your home feel. Thanks for sharing your sources for such wonderful products like those from Mary and Martha! What darling pieces! I’m going to check out Mary and Martha, and also try your cranberry apple cider! LOVE the Mary & Martha items! Going to use some of your holiday decorating ideas. Thanks! Love your home, it’s so warm and inviting! I love reading your blog and find a lot of inspiration for my own decor. I am looking forward to your book coming out! Thank you for sharing! As a M & M consultant I can attest to having a job where God comes first is a true blessing n getting to share Him with others is the icing on the cake! Thank you for opening up ur home n sharing all of ur creative ideas. Have a blessed n bright holidays. I loved all the things in the giveaway especially the lantern. Love, love, love the Martha and Mary shop and had never heard of them before! Would be honored and tickled to have Mand M items in my home! Fingers crossed! Your home is lovely, no matter the season. Excited to check out Mary & Martha. Your home is beautiful. Love mary&martha. Would love to win this giveaway! What a lovely surprise giveaway! I just love your home. I am going to paint my walls with horizontal stripes one day – guaranteed! So much inspiration gathered in one place! The Mary and Martha products look amazing. Always a joy to stop by and breath in some lovely inspiration from your blog. LOVE your decorating style, such an inspiration! Just today I found yuor blog through Pinterest Thanks for sharing all this homemaking goodness–and hosting the giveaway of beautiful house adornments! Just stumbled on this site and LOVE IT…my new favorite. Thanks for all the wonderful ideas!!! I have just moved and am excited to decorate my home. Your home is beautiful! I love the Mary & Martha items- I’m excited to check out their site! With all the Christmas touches around your home already, when will you tell us what you are doing for your tree this year, or is it already up and hidden out of sight? I am making pumpkin cheese bars this weekend for my class at church, looking forward to it! Melissa – I LOVE your blog – I’ve been sneaking over to check it out for a couple years now. I’ve contemplated starting a blog cuz I love decor, cooking and anything DIY, but working outside the house full time I just don’t have time to devote – that’s what retirement will be for. I love the Mary and Martha giveaway and would cherish them if I’m the lucky one! Love your blog! I look forward to every post. I love the way the wreath looks against the white wall! I love all the little touches you do to your home to make it so festive! Just love seeing how you decorate your home this time of year. I am really loving those hand blown glass lanterns! I just LOVE your inspiring website. Thank you for hosting this giveaway!! Thank you for opening up your home and sharing! Very beautiful and welcoming! God bless! I love your blog and just want to thank you for sharing and inspiring me with your beautiful home! Those blown glass lanterns look gorgeous on your bookcases, so cozy and perfect! Love your style – on your blog and in your home! Thanks for introducing us to Mary & Martha. Have already enjoyed there website. Your home looks gorgeous the way you decorated for Christmas. I have not even started to think about decorating for Christmas yet. Your post has inspired me. The giveaways are gorgeous! Can’t wait to see what you come up with this Christmas! Thanks for the opportunity! Happy holidays! Love reading your blog–you have such a beautiful clean style! Love the Mary & Martha accents. Love ALL these ideas!!! Thank you for sharing! LOVE the mugs and tray! and such a beautiful home! Beautiful and tasteful! Thanks for sharing. Your home is so beautiful…..I love seeing how you add special touches! What a great giveaway! Your house looks beautiful and I can’t wait to see what you do with Christmas decor this year! Hi Melissa, the Mary and Martha products are stunning! Thanks for a chance to win them! Your home is so beautiful!!!! I love all the decor! I love that tray! So beautiful. This isn’t helping my urge to decorate for Christmas before Thanksgiving! The crazy cold temps aren’t helping either ;) Happy Holidays! Love the blog. Such fun. It’s all so pretty! Thank you for sharing!! Definitely will check out Mary & Martha. The tray looks very charming. Thanks for the giveaway. The lanterns are so beautiful! I just love them! Love, love, love those glass lanterns! You display them so elegantly! Love some of these sweet, country touches to soften my often modern astetic. This is a great source of those beautiful details. I love those lanterns too! Your beautiful things and clever words inspire me everyday! Beautiful, displayed so charmingly and can be used year-round…what more could we ask for?! 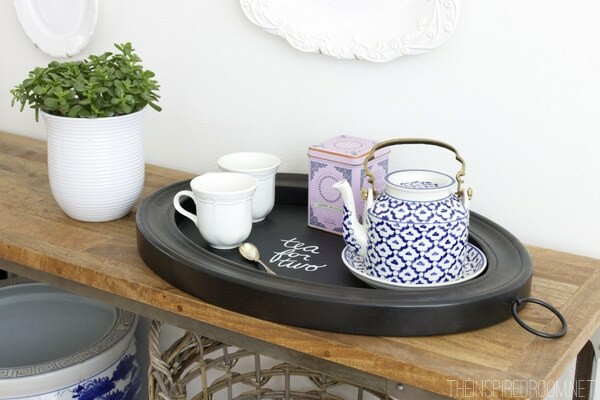 Love that tray – would look perfect in my entryway sideboard table. Everything is so so beautiful! I am hosting Christmas for the first time this holiday season! We are very excited! And hoping to announce the upcoming birth of our 4th! YAY! What a beautiful fall home! I love the items in the giveaway. I really like that there are five mugs in the tray since there are five people in our family! I had never heard of Mary and Martha before today. Thank you! I have a lot of ideas now. Love your blog. I’ve been reading it for sometime, anonymously, but had never posted a comment. I decided it was time to come out! Love your blog and love, love the giveaway! Just gorgeous tray, mugs w/tray and lanterns. Of course I have just the right spot for them! I’ll be checking out the Mary and Martha site for more unique items. Thanks for the giveaway and for inspiring with your blog. Love your blog and love the giveaway! Treasures…. love the Mary & Martha items! Hi Melissa…sign me up girlfriend! I love your blog and only hope that mine can one day bask in your own shadow. Love it. You take such great pics too. Would you mind sharing what you take photos with and the software you use to edit? Your kitchen is one of my favorites and the accessories from Mary & Martha are truly beautiful and sparkly…I love sparkle. Hi Janet! Thank you! Many of these photos are from last year and were taken with a Canon Rebel t2i. Just recently I got a new camera, the Canon 70D and a Tamron lens (28-75mm). We don’t edit our photos a lot but we use Photoshop Elements for that! Have a great Thanksgiving week! Hi, Melissa! I’m a new follower. I really like the simple cleanness of your decor. (I’m a clutter bug of sentimentality)! A good friend had a pig shaped “chalkboard” sign in her kitchen I loved that said “If I can’t be skinny, please let my friends be fat”. Hi! Please sign me up:) Love the plate wall. Thanks for offering such a fun gift! I really enjoy your blog-Happy Holidays to you! I look forward to each post. Such beauty in simplicity. Love all the items, they’re unique but still have a homey feel. What a lovely giveaway, thank you! And thanks for sharing your beautiful home with all of us. What a wonderful way to start the day! Your home is beautiful and it’s always fun to nose around. Thanks much! Love, love the glass lanterns!!! Heading to the Mary and Martha site now. Thanks for the stunning inspiration. I am always inspired by your writing and photographs. Seeing this article today was perfect timing, because I am shifting into nesting mode right now. I really enjoy seeing how you accessorize and love how you use pops of color and various textures on a neutral background. Thank you for featuring the Mary and Martha give away. I love the tray and lantern, and I was just trying to think today of a good way to display coffee cups on our counter. I can’t wait to see more of your posts this winter! i Love your decorating style – simple but so classy! Martha and Mary items are so complimentary for decorating! i LOVE the “&” wooden tray/hanging! I just love everything here! Beautiful inspirations! Thank you. I have never heard of Mary&Martha! Thanks for sharing. I checked out the website; so many pretties and great gift ideas! Cozy times during the holidays. I am sitting by my fire in this early winter feeling snug reading your blog. I really enjoy your blog . I also love Mary&Martha and all of their products! I’m sure you get this all the time, “Come to my home and help me decorate!” I enjoy the things I have I just don’t have the vision… :) I need help in using the things I already have. I love your style! Love those lanterns! You’re posts are always so inspiring! Viewing your blog gives me a feeling of peace and serenity. Although I don’t have the resources to decorate my home as I’d like to, I enjoy looking at the pictures of your home and reading your tips. Have a wonderful Thanksgiving! I love seeing the festive touches in your beautiful home! What gorgeous giveaways! I love your style and I’m looking forward to getting to know Mary & Martha. I am new to your site, and loving it! Thank you! Your blog is new for me and I’m having so much fun looking at it! My favorite blog! I always come here first when I’m looking for inspiration! Thanks! Would LOVE to win this stuff! SO cute! Thanks for inspiring me, Melissa – and thanks for the giveaway, would love to win! love your website! Beautiful decorating ideas, wow! Mary and Martha, two of my favorite biblical women, now a favorite on line store! Thank you for introducing me!